In honor of their 25th anniversary, The Frames have announced 2 gigs this summer in Ireland. Tickets go on sale for these shows on Thursday January 22. Click through for ticket links and to read the full press release! 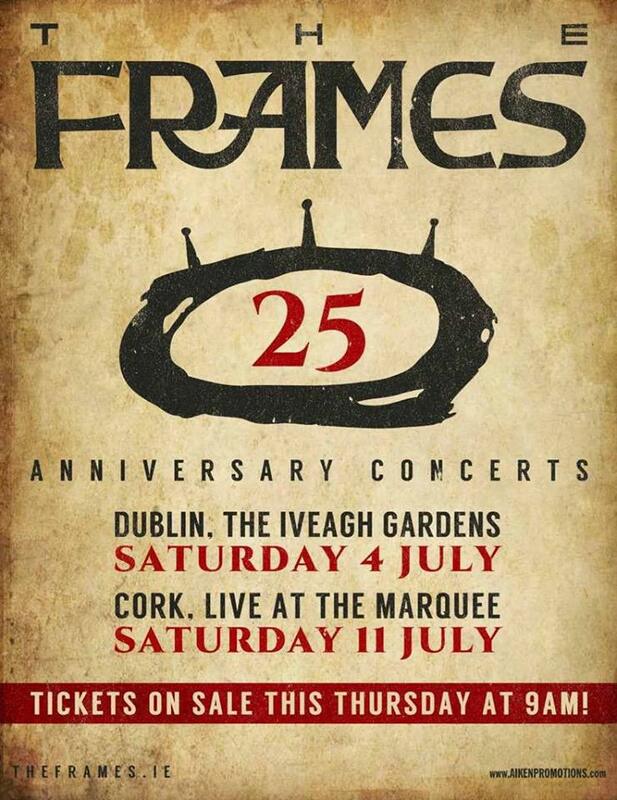 The Frames are pleased to announce two summer shows for the Iveagh Gardens, Dublin and Live at the Marquee Cork to mark 25 years as one of Ireland’s most important rock bands. Acknowledged as one of Ireland’s most successful domestic music acts of their generation, The Frames career spans 3 decades. They released their first album in 1992 and, over nearly a decade bounced through various well-documented record deals and band line-ups releasing consistently excellent records (Fitzcarraldo and Dance The Devil) along the way in spite of it. Finally, as the new millennium appeared the band shook themselves free of outside influences, beginning work on their seminal For The Birds, which they released on their own Plateau label in March 2001. The Frames finished up 2005 with a sold-out gig in Dublin’s Point Theatre and meanwhile in U.S., Burn The Maps finished at No 5 in the New York Times end of year Top 10 releases. 2006 began with Esquire magazine giving them the coveted Best Import award (which Coldplay had won the previous year). Indulging a spot of moonlighting in March 2006, frontman Glen Hansard released a universally acclaimed collaborative Swell Season album (charting at No 5) and tour with Czech singer/pianist/composer Marketa Irglova. The film Once followed in 2007 and the Oscar went to Glen and Mar in 2008 for ‘Falling Slowly”. All of The Frames’ albums to date have achieved Double Platinum sales status in Ireland (with the band’s live album, Set List, and For The Birds selling well in excess of Quadruple Platinum).